Raynor Massage is a unique massage style, taught in our short and intensive massage class. During our classes we teach you to find residual tension held in the body and then how to release it. Raynor Massage does not just treat the area where pain, restriction or tightness is felt. Instead we take a more Eastern approach, looking at the person as an interconnected whole. Pain or restriction felt in one area can actually be held somewhere else, or be the result of emotional stress. This tension may go back many years, and people can become accustomed to unnecessarily living with restriction or pain. In our classes, we do not teach set massage routines. Instead, we teach our students to personalize each treatment to suit the needs of the client. You will learn how to massage areas like the back. legs, abdomen, feet, hands, head and sacrum. We also focus on the energy points and pathways (similar to meridians) of the body. Our instruction teaches you how to develop your sense of touch, to trust your intuition and to work with the client’s breathing to unlock deep seated tension and blocked energy, leaving the client feeling de-stressed, loose, more invigorated and rejuvenated. Raynor Massage aims to get to the heart of health problems by working with both the energetic systems and the physical body. This allows practitioners to achieve a deep level of healing for their clients, giving them the gift of true relaxation. Particularly in parts of Canada where massage has been both medicalized and politicized, a holistic approach to massage and bodywork can be seen as controversial. Raynor Massage has become part of this debate. There are schools and professional bodies who do not accept any understanding of the body which is not based on Western Medicine. There are no written exams or assessments on our courses, we do not require you to study for 2-3 years to be able to qualify as a massage practitioner. Instead we teach you to develop your sense of touch and to learn to trust your intuition. Prior to massage becoming politicized, there were cultures where massage was traditionally passed down through the family, it would be part of everyday life and children would learn at the feet of their elders. There were no exams, there were no requirements to rote learn the Latin names of muscles; people learned how the body should feel when it was relaxed and how to alleviate muscular tension with massage when the person was not relaxed. This apprenticeship style of learning is the fundamental approach that our school takes to teaching Raynor massage. We will teach you how to be highly effective and generate repeat clients. We have three levels of courses, our five day Introductory Certificate is ideal for massaging friends and family or for jump starting a new massage career. Our professional Diploma of Raynor Massage is for those who have previously studied our Certificate class and are wanting to refine their massage skills. The Advanced Raynor Massage Diploma is only available to students who have already earned our Certificate and Diploma qualifications and also have experience in using Raynor Massage. 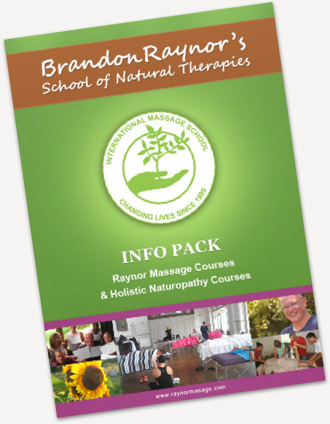 Raynor Massage is only available through Brandon Raynor’s School of Massage and Natural Therapies. Brandon Raynor personally selects and trains all our massage teachers. Our teachers also work with him on an ongoing basis to ensure that the quality of their teaching is excellent and up to date. You can take the Certificate and Diploma classes back to back or at your own convenience. Discounts are also available if you book to study all three classes at the same time, even if you break up when and where you study the courses. Please complete our contact us form for more details or to discuss your individual needs. In Ontario, British Columbia and Newfoundland & Labrador the use of the term “massage therapy” and “massage therapist” is regulated. In order to use terms such as ‘Massage Therapist’ and ‘Massage Therapy’ you need to be a Registered Massage Therapist (RMT). Because this entails up to 3,000 hours of formal academic training, we use other terms to describe our graduates, such as Raynor massage professional. In the provinces mentioned above, only RMTs can give receipts to their clients to claim the cost of treatments from their insurance companies. However, insurance companies are cutting back on the amount they will pay out for massage treatments by RMTs. In our experience, clients of Raynor massage are willing to cover the costs for a treatment themselves because of the effectiveness of Raynor massage to their health and personal well-being. If applicable, during class we will discuss massage regulations and answer any questions you may have. Another important note is that the governments of these provinces recognize that all modalities of bodywork, even those which have a much more holistic approach and work with the energetic systems, have a place within the wider health care provision. You cannot call yourself a RMT after taking our training but you can work legally, get insurance, and provide great Raynor Bodywork treatments to your clients as a Raynor massage professional (RMP). Click here for a discussion about the politics in the massage industry in Canada and registered massage therapists.